The first European artist-naturalists to tour North America in the eighteenth and nineteenth centuries were awed not only by the continent’s varying landforms but also by the animals they encountered: vast herds of buffalo, majestic horned stags, a bewildering variety of birds. The earliest sketches depicting these fauna began the remarkable tradition of wildlife in American art, a tradition that evolved along with the United States as a nation and still thrives today.For more than two decades, the National Museum of Wildlife Art in Jackson, Wyoming, has honored and sustained this tradition by assembling the most comprehensive collection of paintings and sculptures portraying North American wildlife in the world. Wildlife in American Art presents for the first time a generous sampling of the museum’s holdings, charts the history of this enduring theme in American art, and explores the evolving relationship between Americans and the natural resources of this continent.More than a museum catalogue, this volume offers descriptions of individual artists in the collection as well as in-depth, informative essays about what the natural environment has meant to Americans over time—untamed wilderness, sublime creation, endless resource, threatened habitat. Author and art historian Adam Duncan Harris also describes how these meanings have played out in painting and sculpture over the past two centuries. More than 125 full-color illustrations highlight the entire range of the museum’s collection, from the western wilds of George Catlin to the desert drama of Georgia O’Keeffe. Also included are elegant birdstones carved by ancient Americans, exquisite avian artwork by John James Audubon, epic western scenes by Albert Bierstadt, idealistic depictions of unspoiled wilderness by Carl Rungius, and modern takes on the subject by Andy Warhol, Paul Manship, and Robert Kuhn.By bringing together and comparing works of unmatched beauty and majesty, this volume gives to a salient theme in American art the attention it has long deserved. Adam Duncan Harris is Curator of Art at the National Museum of Wildlife Art in Jackson, Wyoming. 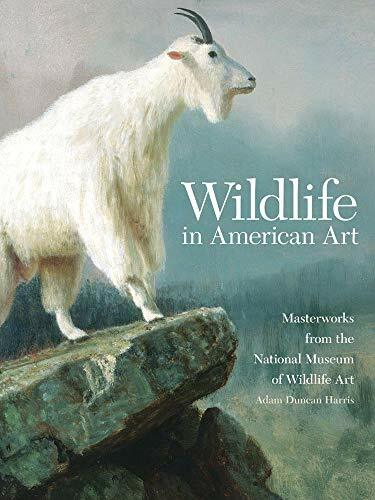 He is the author of Wildlife in American Art: Masterworks from the National Museum Wildlife Art (OU Press, 2009) and the editor of Bob Kuhn: Drawing on Instinct (OU Press, 2012).